A great American favorite without the sugar and salt! Line a 13X9 baking dish with foil. Spray with non-stick cooking spray. Place chicken in baking dish. 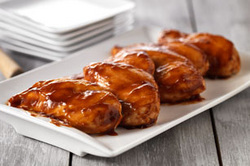 Pour BBQ sauce over chicken. Bake 40-45 minutes until done.